Souvenir Guide of the Woburn Wild Animal Kingdom (now Woburn Safari Park). We understand this to be the first souvenir guide to be published for the park, so it very collectable. 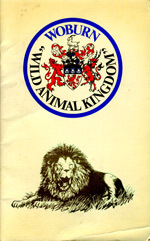 It includes colour photographs of various animals, a foreword by the Duke of Bedford, a photograph of founder Jimmy Chipperfield (of Chipperfields Circus) with a lion and the inside back cover is a park map. Condition: English language; 8vo - over 7.75" - 9.75" tall; good condition. Crease to bottom right hand corner of booklet. ©2000-2018 Joyland Books. All Rights Reserved.